Gall Thomson Flip-Flap Marine Breakaway Couplings deliver 100% leak-tight closure and a totally safe and spill-free separation of the hose transfer system. This MBC type is ideal for the safe transfer of liquid gases, hazardous chemicals, white oil products, low viscosity and low velocity fuels and short-term crude oil Early Well Test or Early Production Systems. 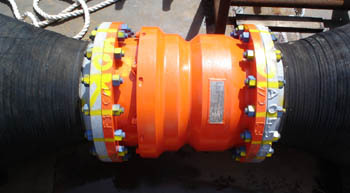 This Flip-Flap Marine Breakaway Coupling provides an identified safe parting point in marine hose transfer systems and automatically shuts off product flow in the event of an extreme tensile load being applied to the hose string following a tanker breakout, or an excessive pressure surge in the line during tanker loading. This design is suited to the rigors of the marine environment and reduces the risk of damage to assets, injury to personnel and harm to the environment. Suitable for marine terminals handling low viscosity products such as kerosene, gasoline, diesel, fuel oils, LPG liquids and vapour, condensate etc., and certain light crude oils in systems where the flow rate is relatively low, and temporary loading and offloading systems. Loading and offloading facilities at SPM (Single Point Mooring) terminals. Loading and offloading facilities at CBM (Conventional Buoy Mooring) terminals. Offshore barges, pontoons or other marine terminal applications where low viscosity products are being transferred. 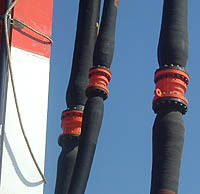 Of the large number of tanker breakout or extreme pressure surge incidents where Gall Thomson Flip-Flap Marine Breakaway Couplings are employed, on each occasion the device has operated precisely as intended; saving the hose strings and assets from damage, preventing pollution and averting risk to operations personnel. Each unit was re-instated for re-installation into its respective transfer system. 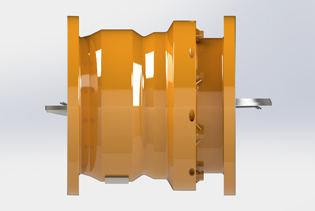 The lowest headloss of any Flip-Flap Marine Breakaway Coupling. An unmatched record for efficient performance and integrity. 100% leak-tight closure providing totally safe and spill-free disconnection, being ideally suited for liquid gases, hazardous chemicals, white oil products, low viscosity and low velocity fuels and short-term crude oil Early Well Test or Early Production Systems. No moving parts during normal service eliminates the requirement for maintenance whilst installed in the hose string. The units should be removed for refurbishment at 3-5 year intervals, normally during a hose string change-out. A well tried and tested corrosion protection system is applied to the MBC external surface and all internal components are manufactured from stainless steel, ensuring excellent corrosion resistance. Due to the reserve buoyancy of adjacent hoses and the lightweight construction of the unit, additional buoyancy aids are not usually required when installed in a floating or submarine hose string. The unit requires no outside power source. This eliminates dependency on other components or mechanisms. The system is totally self-motivated and self-energised, requiring no human intervention. The shut-off is powered by the energy of the flowing product acting on the valve assembly. The unit is therefore not vulnerable to the reliability of an external power supply. In addition, springs will ensure valve closure should there be no flow at the time of activation. The coupling can be re-instated after a breakout or re-installed in a new hose string during a routine change out. The Gall Thomson MBC has a proven life span of up to 20 years assuming maintenance is carried out at the recommended intervals. The unit is simply bolted between hose joints in the recommended hose string location and requires no commissioning or installation engineer; this function normally being performed by the client’s usual site personnel or contractor. The design ensures that operational loads such as bending moments, torsional stresses and cyclically applied loads created by wave and wind motion, tanker movement and pumping vibration are absorbed and therefore have no adverse effects on function or condition. The compact and lightweight design negates the necessity for additional buoyancy and ensures that there is no detrimental effect on the hose string. The diameter of the unit being smaller than the adjacent flanges and hoses, avoids external mechanical damage to the MBC and stress fatigue to adjacent hoses. Valve disks are positioned in line with flow; providing minimum headloss. Due to stress on the breakstuds or a surge in flow, the coupling is parted. When the coupling parts, the combined energy of the bias springs and product velocity flips the discs through a controlled arc. The disks snap onto their seats providing 100% leak-free shut off. To prevent potential damage to pumps, meters, expansion joints, hoses, gaskets, etc., during high velocity transfer, valve closure can be executed at a controlled rate on the upstream side or in both directions in the case of a bi-directional flow system. Alternatively, the system can provide an instantaneous shutdown where feasible. Sizes: range from 3” to 24” nominal bore. Offshore grade forgings are used for the main body components. The break assembly is made from high grade titanium alloy that is rated, tested and certified. Extensive material testing combined with long term field experience ensures performance integrity and in-service reliability in all environmental conditions. Materials can be varied to suit desired specifications. The torsion springs are bias and is a backup system. The springs are therefore not depended upon to close the valve. The springs will effect closure where there is no product flow when breakout occurs. The final breakstud rating is determined following basic calibration and proof tensile testing on sample breakstuds. These samples are machined from the same titanium material in its final treated condition as used in the final product. These breakstuds are not shearbolts and therefore act in controllable tension. The unit can be pre-set to suit the limitations of the product transfer system in respect of linear overload and pressure surge. Double closure design provides valve closure on both the upstream and downstream sides of the separation point. Closure delivers instant shut-off. This is suitable for operations with lower loading rates or short piping systems where damage to asset due to instant closure is unlikely. Variable valve closure speeds provide anti-line shock shutdown to protect up-line assets such as pumps, meters, hoses and gaskets for higher loading rate systems. The Standard Unit will activate in two circumstances. The Standard Unit will part on linear overload. This may occur due to a tanker moving off station due to a manoeuvring fault, an unexpected wave, wind or general inclement weather conditions. In cases of tanker breakouts or extreme pressure surge incidents where no MBC is installed, the consequences can be horrendous, with ruptured hoses and major oil spills. However, with an MBC installed system damage will be avoided and pollution will be prevented. The Standard unit will activate where an extreme internal pressure surge occurs: caused by an unusual event such as an inadvertent sudden valve closure downstream of the breakaway coupling. The Stabilised unit will activate in one circumstance. The Stabilised Unit will activate on linear overload as with the Standard Unit. The Stabilised Unit will not activate due to a pressure surge but is instead designed to possess the same integrity as the rest of the transfer system.